The number of homes for sale in Tallahassee has hit an eight year low, but appears to be starting the normal seasonal rise that begins in late January or early February of most years. 2015 is shaping up to be quite different than previous years, when high inventory levels weighed the market down and discouraged value appreciation at most price points. But supplies are back to normal levels for most price ranges, so we will be closely monitoring housing inventory levels to identify the strongest and weakest points in the Tallahassee real estate market. 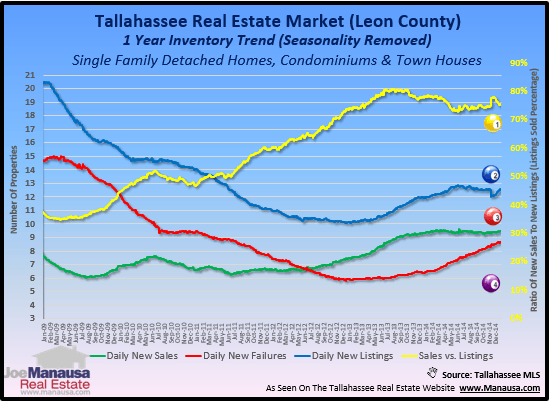 The real estate graph below contains three key trends that impact housing inventory levels in the Tallahassee real estate market. The information comes from a daily review and recording of the Tallahassee MLS "hotsheet," which reports changes to the inventory from the prior day. The blue line shows the one-year trend of new listings posted each day, while the green line shows the number of closings recorded daily. The red line shows the number of homes leaving the market every day without selling, and the yellow line measures the ratio of homes sold to new listings taken. This report shows that for the majority of 2014, failures (homes that failed to sell) accelerated at a rate consistent with the rate of new listings entering the market. Fortunately, December was a strong month for closed home sales and could very well start to level off the rising rate of failures. Home Sellers - Time To Move? If you have been thinking about selling a home in Tallahassee but thought the market was not there for your home, you might want to re-evaluate your situation. Sure, there is still a high rate of homes failing to sell, but the rate of homes successfully selling has been on the rise. The key to making the decision ... sell versus wait ... rests in what you will do after the sale. If you plan on selling your home and then purchasing another with borrowed funds, I believe it is in your best interest to move as soon as possible. With mortgage interest rates near historical lows, you will likely reduce or keep your housing affordability at its lowest point by moving fast. If you plan on selling your home and then purchasing another with cash or renting, I do not think you need to be in a hurry. For most price ranges, home values are on the rise and you will likely get more money if you wait to sell. If you would like help evaluating your present situation and your best courses of action, drop me a note and we can schedule a time to help you make your best move.